There was no What’s App or Facebook in Andersen’s Snow Queen story which inspired our Snow Q collaborative project of course but paper was scarce too. So the old woman of Lapland wrote messages to her Finnish friend on the back of fish, which on being read could go in the stew. 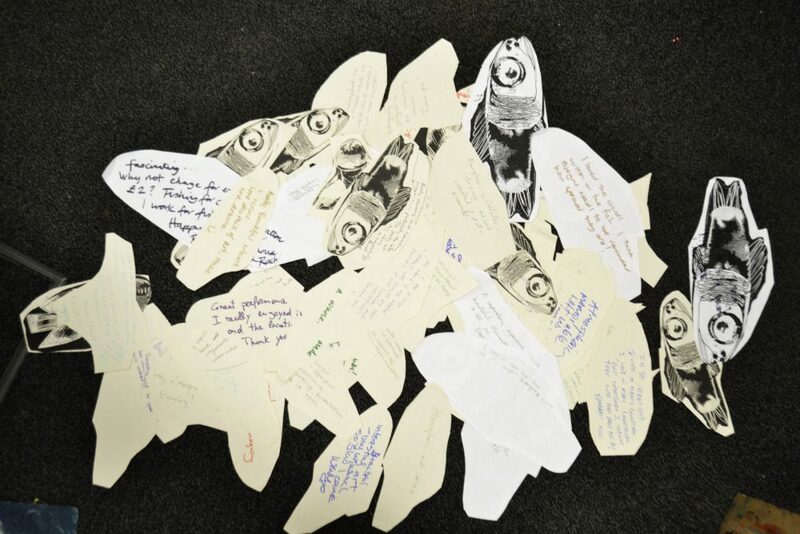 Members of Older and Out wrote us messages on ‘fish’ for younger LGBT people which we incorporated into our installation. We also used fish for the audience’s feedback. Fishing for compliments? one cheeky person wrote! And compliments there were a plenty. What do you do with compliments? Are you meant to shrug them off? Not blow your own trumpet? Most artists I know struggle with gigantic self doubt and insecurity. Dagmara touched on it in an earlier post. Is that because the arts attract ‘sensitive’ people or could it be the whole way art is treated in a competitive, profit-led society? Unless you are an artist whose work is auctioned for eye-watering amounts on a scarcity basis, you’re unlikely to be valued much or seen as doing ‘real’ work. This blog was originally published on Snow Q Project‘s website on 19 January 2019.